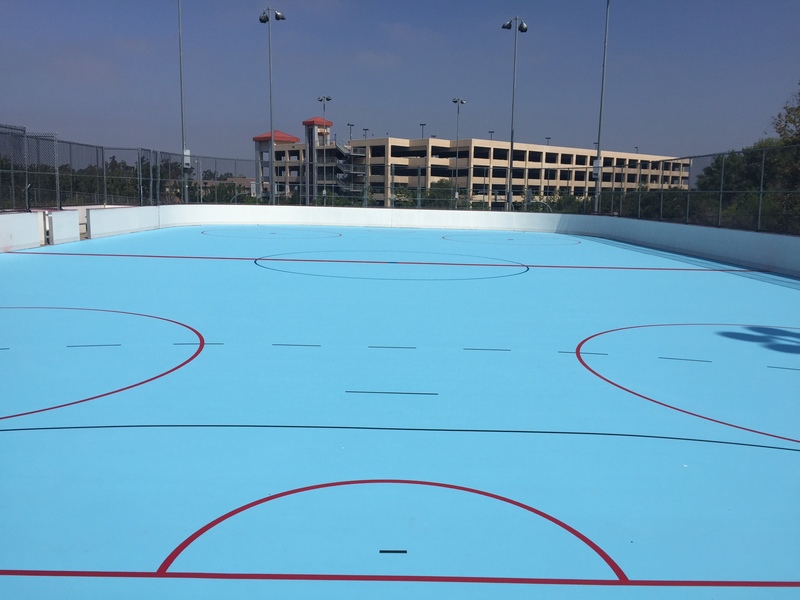 SkateMaster is a 100% acrylic coating designed to provide a durable surface for inline skating and roller hockey. From casual skating to the rigors of competitive inline hockey, SkateMaster™ provides the optimum surface. Standard colors are Ice Blue and Dove Gray. Neutral SkateMaster™ is also available when additional colors are desired. Simply mix ColorPlus™ Pigment Dispersion with Neutral SkateMaster™ to achieve desired color. Mix 4 gallons of ColorPlus™ Pigment Dispersion with one 55-gallon drum of Neutral SkateMaster™. Or, mix two gallons of ColorPlus™ Pigment Dispersion with one 30 gallon keg of Neutral SkateMaster™. The SkateMaster system can be applied on properly constructed asphalt, concrete, or existing acrylic surfaces. SkateMaster is ideal for indoor or outdoor applications. 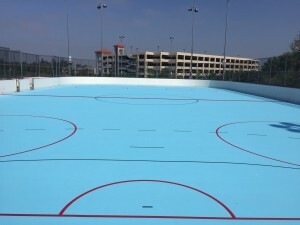 If you are interested in getting cost estimates for construction or resurfacing of an inline roller skating area, contact us for referrals to qualified sport surfacing contractors in your area. A premium 100% acrylic emulsion designed for maximum performance and weather resistance. Neutral SkateMaster™ can also be used as an acrylic resurfacer filler coat. 100% Acrylic resurfacer is designed to smooth and level pavement prior to color coating. Can be used for a coating or patching material. Available in Black and Neutral. 100% Acrylic liquid binder designed for on-site mixing with sand and cement. Ideal for leveling and repairing low spots and depressions upto 1/2 inch deep. 100% Acrylic trowel grade crack filler. Fortified with sand for filling cracks up to 1 inch wide. Available in red, green or neutral. For Sharp Lines! 100% Acrylic clear drying emulsion primer that is applied prior to T/C line paint to fill the minor voids between the masking tape and court surface. Assures crisp, razor-sharp lines. 100% Acrylic water based line paint highly pigmented for one coat coverage.